First grown in the Southwest during ancient times, tepary beans mature quickly and are tolerant of the low desert heat, drought and alkaline soils. They are among the most drought and heat tolerant crops in the world. Tepary beans are high in protein and contain soluble fiber helpful in controlling cholesterol and diabetes. 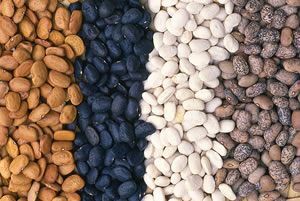 Generally white tepary beans have a slightly sweet flavor and brown tepary beans have an earthy flavor. Tepary beans can be used in place of any standard dried bean. Soak the dried beans before cooking. Other names for this native bean include Pawi, Pavi, Tepari, Escomite, Yori mui and Yori muni.